Parker, CO – April 11, 2012. IDA President, Wayne Connell had the opportunity to spend the day with the great people of Allsup including Tai Venuti, Manager of Strategic Alliances who played host and tour guide for the day. Headquartered in Belleville, IL, Allsup Inc. is the nation’s premier provider of Social Security and Medicare disability claim services. Whether providing service directly to the consumer or working with employers, insurers, group health plans, or workers’ compensation benefit programs, their expertise and systems have resulted in a 98 percent award rate and maximum recoveries from both Social Security and Medicare. Allsup has helped more than 170,000 people since 1984 to receive their Social Security Disability Insurance benefits. In addition, Allsup provides Medicare plan selection and disability life planning services. Wayne started his visit with a group of Allsup employees and management. He shared with them his seminar, Invisible No More!sm, Seven Realities of the Invisible Becoming Visible. Following a lengthy question & answer session about invisible disabilities and how to learn the language of invisible disabilities, Wayne visited the various departments throughout Allsup. He learned of the tremendous work the Allsup team members are performing in helping those seeking social security disability as well as helping them navigate Medicare, Medicaid, health insurance and financial principles. After an enjoyable lunch with a group of Allsup management, Wayne finished the day with Executive Vice President and Chief Operating Officer, Ron Buerges. IDA is very excited to have the opportunity to partner with Allsup on various programs and initiatives, now and in the future, to help those touched by illness, pain and disability. Of special note, the President and CEO of Allsup, Jim Allsup received IDA’s 2009 Advocacy Honors Award. For more information and a Free Social Security Disability Consultation visit Allsup.com. Last Tuesday evening, August 30th, IDA founder and president, Wayne Connell, was privileged to attend along with fellow IDA board member, Steve Tonkin, an event sponsored by the Second Wind Fund, Inc. at the downtown Denver Post building. Steve is a board member of the Second Wind Fund, Inc. as well. So what is the Second Wind Fund? The mission of Second Wind Fund, Inc. is to decrease the incidence of teen suicide nationally by removing financial and social barriers to treatment for all at-risk youth and to create a network of local affiliates to provide such services in their own communities. Scott Fletcher, Jeff Lamontagne, and Dr. Marjorie Laird founded SWF in 2002 in Lakewood, Colorado. In 2009 their flagship Affiliate, Second Wind Fund of Metro Denver (SWFMD), was formed to manage the local program in the six county Denver metro area. Second Wind Fund, Inc. manages the national program and the Affiliates. While other suicide prevention organizations offer broad suicide prevention education and awareness, SWF offers actual treatment services to at-risk youth. It is essential that youth receive treatment immediately. SWF has built an innovative program to urgently match an at-risk youth, who may be displaying suicidal tendencies, with a therapist in their neighborhood. There is no red tape, no delays while insurance gets approved and complete anonymity. If the referred teen does not have insurance or the means to pay for the necessary mental health treatment, the care is paid for by SWF. When necessary, SWF clients have up to 20 sessions with a specialized, licensed therapist, as frequent as necessary until the teen’s suicidal thoughts have turned to life-long coping skills. The Invisible Disabilities Association applauds the Second Wind Fund for being an organization that helps remove the shame and stigma regarding suicidal thoughts sometimes brought about by mental illness, depression and daily battles with other unseen chronic illnesses and pain by providing immediate, direct support. Part of IDA’s mission is to bring hope to teens living invisible disabilities and let them know they are not alone and that they can find additional help from organizations such as the Second Wind Fund, Inc.
Jason Graham grew up in southeast Denver in a family of five children. Jason graduated from Thomas Jefferson High School in 1991. He battled both a brain tumor and kidney disease from the age of 29, Jason was diagnosed with both a pituitary brain tumor and kidney disease. He had successful brain surgery just before his 30th birthday. In Dec 2006, Jason received a kidney transplant donated by his mother Marilyn. The kidney functioned at a minimum over the next four years, causing him to need another. However, a chronic cough caused him to have to wait for the second transplant. On 10-10-10, Jason Graham received the Inspiration Award from the Invisible Disabilities Association. During the banquet, Jason credited his faith in God, support of his family and friends, and good medical care with keeping him emotionally strong during his many trials. Shortly after the awards banquet, Jason’s health took a turn for the worse as he developed several very serious complications with his kidneys, as well as a mass and fluid on his brain. He was in and out of the hospital and soon unable to work. In December, they put a drain in his head because of the swelling and underwent aggressive treatments for what they discovered to be a rare brain cancer. 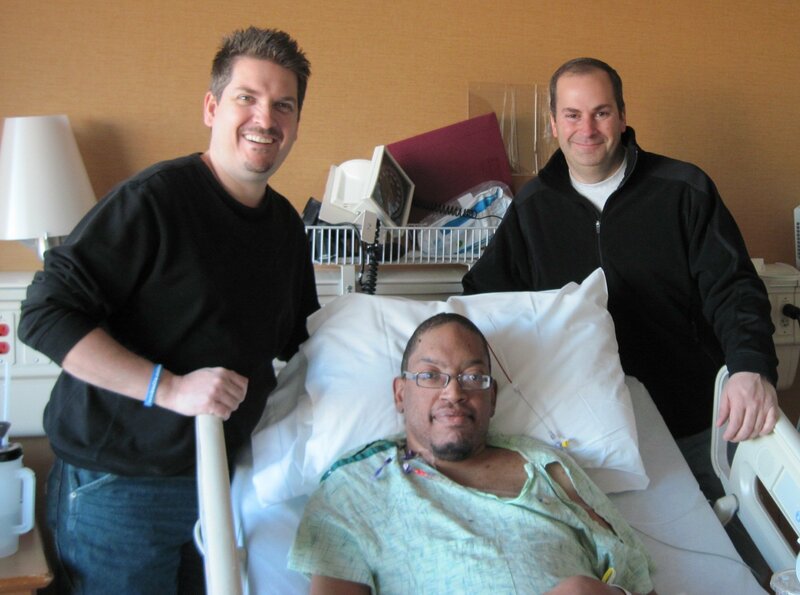 IDA President, Wayne Connell and Executive Board Member, Todd McPherson visited Jason in the hospital. Jason’s wife, Michelle, began writing articles for IDA to share their family’s struggles with his health, losses and her new role as a wife, mother and caregiver. Later, Jason had brain surgery to remove the rare, cancerous tumor. He remained unconscious for a couple of weeks. 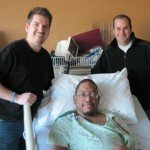 One day, out of the blue, Jason woke up and called his family from his hospital room! This gave everyone hope, as he began to show signs of recovery. Jason was not out of the woods, but was able to communicate with his family. On Saturday April 2nd, Jason’s nurses wheeled him outside in his bed to enjoy the beautiful spring day and to get some fresh air. That night, he unexpetedly passed away from a sudden, massive brain bleed. 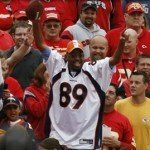 Jason at Bronco’s game being introduced on the big screen! Jason was an amazing son, brother, husband, father and friend to many. He was known for his faith, perseverance, contageous smile, hugs and love for others. Jason’s entire family is a group of outstanding, loving, giving people. Michelle has been caring for Jason and has written several articles for the Invisible Disabilities Association. 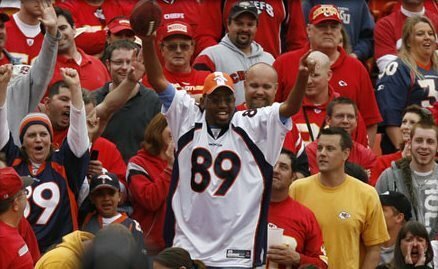 His father Tom and his brother Daniel were both football players for the Broncos. Daniel and his mother Marilyn also run the Daniel Graham Foundation that reaches out to kids to teach them integrity, team work and life skills. The IDA Team is so grateful for the opportunity to honor Jason and share his inspirational story of courage through his 9 year battle. He will be dearly missed by us all. Founder Wayne Connell with Actress Dyan Cannon April 2010 in Hollywood. Wayne and Executive Board Member, Steve Tonkin were attending the Lift Up America event, honoring children at the Grauman’s Chinese Theatre. IDA Founder and President, Wayne Connell with new friend and Producer, Donna DeBerry and CNN Reporter Soledad O’Brien April 2010 in Hollywood. Connell enjoyed sharing about IDA and those living with invisible disabilities.